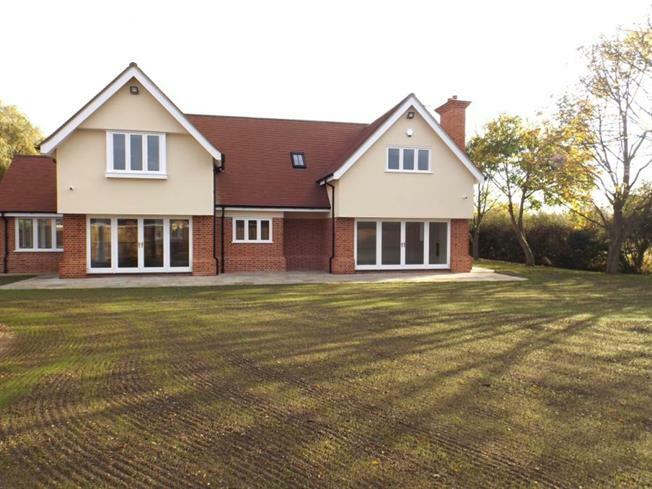 5 Bedroom Detached House For Sale in Colchester for £1,250,000. Built to a high specification this well designed home offers versatile living accommodation throughout. The internal accommodation comprises of an open plan kitchen/diner and garden room, two generous reception rooms, a study, utility room and cloakroom. On the first floor there are four double bedrooms, two of which have en-suites and a main family bathroom which are all accessed from a mezzanine. There is a guest suite, accessed via a separate staircase that has a walk in wardrobe and en-suite shower room. The entire property has under floor heating and has been finished to a high standard, with solid oak doors and granite work surfaces. The property is located in Little Tey which provides direct access to the A120 and is less than a 10 minuet drive to the A12 and Marks Tey train station, where there is a direct link to London Liverpool Street. There are gardens to the front and rear as well as ample off road parking and a triple garage. Spacious entrance hall with a glass fronted mezzanine, two separate staircases one leading to the main living accommodation and the other leading to a separate bedroom with walk in wardrobe and En-Suite. Two double glazed windows to the front aspect, situated either side of the front door. Solid Oak flooring with under floor heating, spotlights and down lights from the mezzanine. Mumford and Wood bespoke windows to the front, side and rear aspects, overlooking the gardens. Double doors leading to the rear garden. Blanco Stellar quartz worktops and upstands. Bespoke, solid oak, wall and base units that have been hand made and painted by Beckingham Designs, offering soft close doors and chrome handles. The middle island has a separate stainless steel sink with a Quooker instant hot water tap. To the far side, over looking the front garden there is a Villeroy Boch double butler sink with Franke mixer tap. Benefiting from integrated appliances including two wine coolers, a fridge/freezer, dishwasher and microwave. There is a large range comprising of three electric ovens, seven burners and an overhead extractor fan, situated above a grey glass splashback. Solid oak flooring with underfloor heating. Wall mounted heating control. Spotlights. Solid wooden door to the side leading to the garden, double glazed window to the side aspect. Wall and base mounted units with a solid wood work surface and an insert butler sink. Bosch washing machine and tumble dryer. Large double cupboard housing a water softener. Built in cupboard housing the boiler. Solid oak flooring with under floor heating. Wall mounted heating control. Bespoke double glazed doors to the rear aspect over looking the garden, double glazed windows to the side aspect. Underfloor heating and carpet. Log effect wall mounted gas, glass fronted fire. Wall mounted heating control. Bespoke double glazed doors to the side aspect, double glazed windows to the front aspect. Underfloor heating and carpet. Double storage cupboard housing WIFI connections. Wall mounted heating control. Double glazed window to the side aspect, storage cupboard. Underfloor heating with carpet over. Wall mounted heating control. Eight cameras outside with security system position for subsequent computer installation and monitors. Viega concealed cisterns with Duravit WC, wash hand basin, underfloor heating. Separate staircase leading to the guest or master suite which benefits from underfloor heating and a built in wardrobe. Bespoke double glazed windows to the front and side aspect. Obscured double glazed window to the side aspect, Merlun Truestone walk in shower tray with a glass panel, Hansgrohe taps, shower valves, drencher shower heads and hand showers. Integral WC, with a granite shelf above, wall mounted chrome heated towel rail. Wall mounted anti steam mirror with touch light surround. Spotlights. Underfloor heating. Part tiled walls. Bespoke solid oak staircase and banisters with glass fronting. Individual spot lights on each step skylights, spotlights. Underfloor heating with carpet over. Airing cupboard and loft access. Bespoke double glazed window to the rear aspect, walk in wardrobe with lights. Underfloor heating with carpet over, spotlights. Skylight, Merlun Truestone walk in shower tray with a glass panel, Hansgrohe taps, shower valves, drencher shower heads and hand showers. Integral WC, with a granite shelf above, wall mounted chrome heated towel rail. Wall mounted anti steam mirror with touch light surround. Spotlights. Underfloor heating. Part tiled walls. Bespoke double glazed window to the front aspect. Underfloor heating with carpet over, spotlights. Bespoke double glazed window to the side aspect, built in double wardrobe. Underfloor heating with carpet over. Bespoke double glazed window to the rear aspect, built in double wardrobe. Underfloor heating with carpet over. Obscured double glazed window to the side aspect, Merlun Truestone walk in corner shower tray with a glass doors, Hansgrohe taps, shower valves, drencher shower heads and hand showers. BC Designs free standing bath. Integral WC, with a granite shelf above, wall mounted chrome heated towel rail. Wall mounted anti steam mirror with touch light surround. Spotlights. Underfloor heating. Part tiled walls. Fully landscaped garden with an indian standstone patio, the remainder being laid to lawn, fence enclosed boundaries with a rear gate leading to the parking area. Attached to the triple garage is a shed, suitable for a drive in lawn mower, benefiting from an electric door. External tap. Shared access driveway with CCTV and ANPR cameras, leading to a triple garage which has white electric Alutech M-Ribbed insulated garage doors. Partially enclosed front garden, mainly laid to lawn with an Indian sandstone path leading to the front and side of the property.